2. What's the best way to discipline a toddler? Tiny toys and toys with small removable parts can be swallowed or become lodged in a child’s throat, windpipe, ears or nose. The seams of poorly constructed stuffed dolls or animals can break open and release small pellets that can be swallowed or inhaled. Toys of brittle plastic or glass can be broken easily, leaving dangerous, sharp, cutting edges. Metal and plastic toys sometimes have sharp edges due to poor construction. Broken toys can expose dangerous prongs and knife-like sharp points. Pins and staples on dolls’ clothes, hair and accessories can easily puncture an unsuspecting child. Toy caps and some noise-making guns and other toys can produce sounds at noise levels that can damage hearing. Do not allow children to fire cap guns closer than one foot to the ear; also, do not use indoors. Projectiles - guided missiles and similar flying toys - can be turned into weapons and can injure eyes in particular. Children should never be permitted to play with adult lawn darts or other hobby or sporting equipment that have sharp points. Arrows or darts used by children should have soft cork tips, rubber suction cups or other protective tips intended to prevent injury. Teach children that these toys should never be aimed at people or pets. Electric toys that are improperly constructed, wired or used can shock or burn. Electric toys with heating elements are only recommended for children over eight years old. Children should be taught to use electric toys cautiously and under adult supervision. 7. Wrong Toy for the Wrong Age. Toys that may be safe for older children - like a chemistry or hobby set or games with small pieces - can be extremely dangerous in the hands of little ones. Toys with long strings or cords maybe dangerous for infants and very young children. The cords may become wrapped around an infant’s neck, causing strangulation. Never hang toys with long strings, cords, loops or ribbons in cribs or playpens. Pacifiers should never be attached to strings or ribbons around a baby’s neck. Wish you could work from home and spend more time with your toddler/young children? Here are some of the things you could do right from the comfort of your home …..
WHAT'S THE BEST WAY TO DISCIPLINE A TODDLER ? At any age, discipline should focus on teaching children how you want them to behave, not punishment. Because children learn differently at different ages, discipline and teaching techniques should take into account the child's developmental level and ability to learn. During the toddler years, the best techniques for teaching children how you want them to behave and avoiding frustration are repetition, distraction, and supervision. Repetition is important because children between the ages of one and three need a lot of practice to learn new concepts. The concepts involved in following directions, taking turns, and delaying gratification are new and challenging for toddlers and are learned only through constant practice. It's no use getting upset because you've told your son over and over not to climb on the table — he may need to hear that a hundred or more times before he finally remembers what you said and can use that information to modify his own behavior. 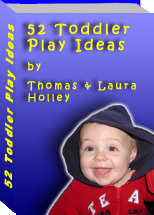 Distraction is especially important for helping toddlers avoid trouble. Once you've told your toddler not to climb on the coffee table, it may sink in better if you leave the living room and find something else to do. If you leave him alone in the tempting situation, he'll still realize the consequences — you said no, and you don't want him to do it. If you stay, you'll have to keep stopping him, and sooner or later someone is going to get frustrated. The important thing is that your child learns that no means no, not that the two of you get into a battle of wills. Your child will eventually learn that climbing is not allowed, but he can find other fun things to do. You want him to learn how to find alternatives to behaviors you don't allow. Supervision involves being alert to your toddler's moods and avoiding difficult situations. Avoid confrontations by "toddler-proofing" your child's environment so that most temptations are out of sight and true safety concerns are kept to a minimum. It's much easier for a child to learn what "no" means if it applies to only a few situations — no hitting, no climbing, no running in the street, etc. — instead of a long list of no-no's (no touching the VCR, no touching the cat's food, no opening the cupboard doors, no going down the stairs, and so on). If things he's not to touch are out of reach and you put up gates to prevent your toddler from going where he's not allowed, you greatly reduce the number of rules and prohibitions he needs to understand along with his risk of making mistakes or even injuring himself. The above article was written by Judith A. Hudson, Ph.D., an associate professor of psychology at Rutgers University in New Brunswick, New Jersey. She has authored many research articles and book chapters on cognitive development in toddlers and preschool children.